The Holiday Season is here and many people are dreaming of a white Christmas. The likelihood of seeing those dreams come true, however, are largely dependent on where you live. 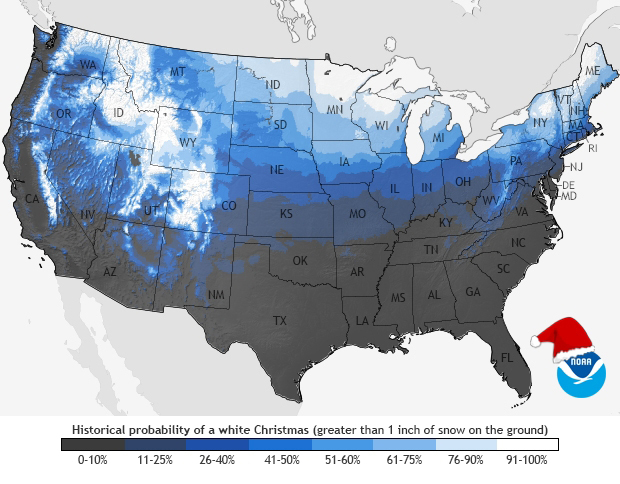 Here in New York City, the historical chance of having a white Christmas is about 12%. This low probability is largely due to the city’s proximity to the Atlantic Ocean and its moderating influence on temperature. This year, with rain and unseasonably warm temperatures in the forecast, the city’s already minimal chance for snow has largely melted away. Snow or no snow, The Weather Gamut wishes you and your family a very Happy Holiday! Today is the December Solstice, the first day of winter in the northern hemisphere. The new season officially begins at 23:03 UTC, which is 6:03pm EST here in New York City. The astronomical seasons are produced by the tilt of the Earth’s axis – a 23.5° angle – and the movement of the planet around the sun. 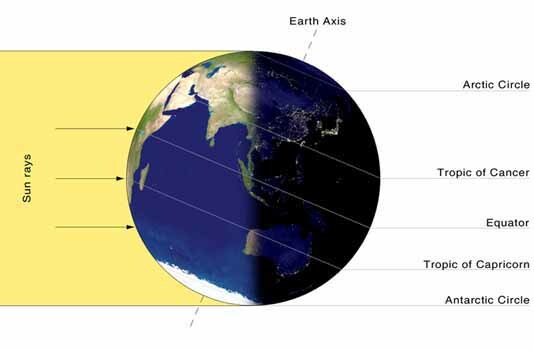 During the winter months, the northern half of the Earth is tilted away from the sun. This position brings the hemisphere the least amount of solar energy and its coolest temperatures of the year. Since the summer solstice in June, the arc of the sun’s daily passage across the sky has been dropping toward the southern horizon and daylight hours have been decreasing. Today, it reached its southern most position at the Tropic of Capricorn (23.5° south latitude) marking the shortest day of the year. This observable stop is where today’s event takes its name. Solstice is derived from the Latin words “sol” for sun and “sisto” for stop. Now, the sun will move northward again in our sky and daylight hours will slowly start to increase. Marking this transition from darkness to light, the winter solstice has long been a cause for celebration across many cultures throughout human history. Over the past few weeks, rounds of intense rainstorms fueled by a phenomenon known as a Pineapple Express have soaked the west coast of the United States and helped put a modest dent in California’s nearly 3-year drought. 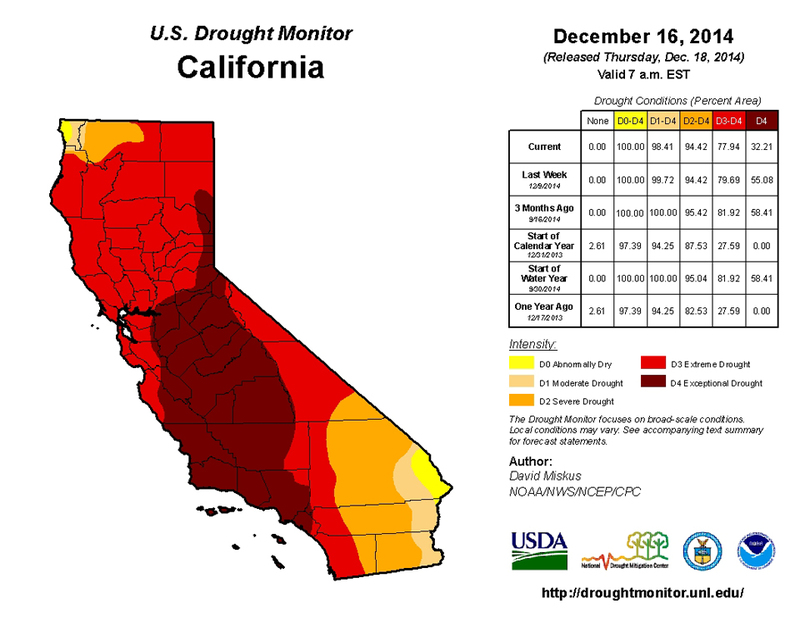 According to the latest report from the US Drought Monitor, 32% of California is currently facing conditions of “exceptional drought”, the worst possible category. That is an improvement from last week’s 55%. Nonetheless, 100% of California – a state generally considered to be one the most productive agricultural regions in the world – is still in some form of drought. Water levels in reservoirs throughout this country’s most populated state also remain low. Lake Shasta and Lake Oroville, the two largest reservoirs in California, are both currently at 33% of total capacity and only 55% of the historical average for the date. With winter considered the “rainy season” in California, it is possible for additional storms to continue slowly reducing the region’s long-term drought conditions. Scientists working with NASA’s Gravity Recovery and Climate Experiment (GRACE) satellites say that California needs 11 trillion gallons of water, enough to fill more than 16 million olympic-size swimming pools, to completely end the drought. After two weeks of negotiations, a global agreement – however modest – was reached at the UN Climate Change Conference in Lima, Peru this weekend. The deal, known as the Lima Accord, marks the first time in history that all nations have agreed to reduce their rates of greenhouse gas emissions. Up until now, only developed nations had been required to act. Since the UN first started holding climate change conferences in the mid-1990s, many of the larger less developed nations, including China, India, and Brazil, have become industrial powerhouses adding significant amounts of greenhouse gases to the atmosphere. In fact, China is now the world’s largest carbon polluter. Under the current agreement, every country will submit an “intended nationally determined contribution” or INDC. These are essentially plans, due in the spring, in which individual countries spell out how much CO2 emissions they propose to cut after 2020 based on their own domestic economic and political situations. Collectively, these independent plans will form the framework for a global climate treaty set to be finalized at the UN Climate Conference in Paris late next year. While this bottom-up approach helped secure the participation of all countries, it is not legally binding and leaves countries with the latitude to make as little a contribution as possible. That said, this new accord cuts through some of the historic blame game and recognizes climate change as a global problem that requires a global solution. The question is, will the proposed aggregate reductions in greenhouse gases be enough to meet the current international goal of limiting global warming to less than 2°C (3.6°F) above pre-industrial levels and stave off the worst impacts of climate change? 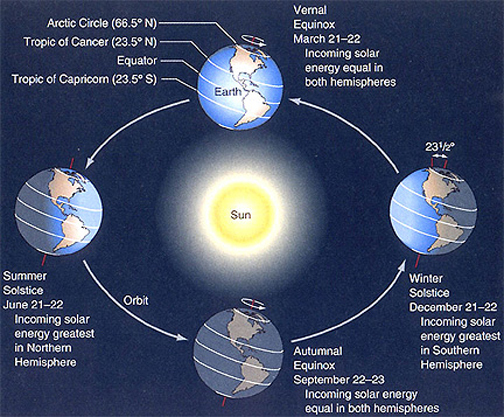 Seasons are a way of dividing up the year based on changes in weather and daylight hours. Winter, spring, summer, and fall – the traditional four – are familiar to most people. However, while traveling in southern Arizona recently, I had the opportunity to learn about the unusual fifth season of the Sonoran Desert. The Sonoran desert, covering a large part of the southwestern US and Northern Mexico, basically divides its summer into two parts. “Fore-summer”, occurring in May and June, is very hot and very dry. “Summer monsoon season” follows it from July to mid-September and brings the region soaking rains. It is considered the major growing season. Surprisingly lush by desert standards, the Sonoran Desert is one of the wettest deserts in North America. This is due to the fact that winter there is considered a second rainy season. While the precipitation that falls between December and January is generally not as intense as during the monsoon months, it tends to be more widespread. 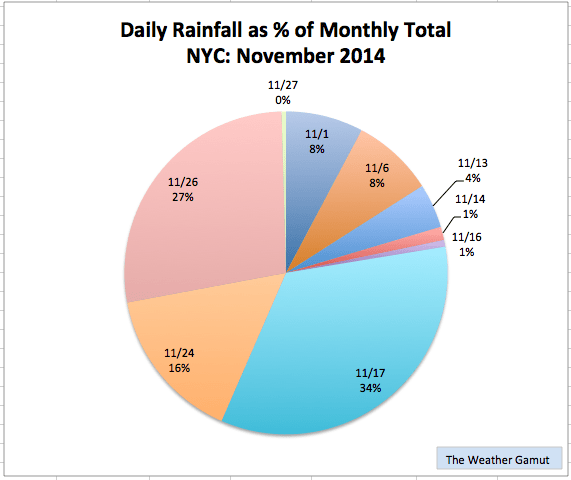 Overall, the region averages between 3 and 12 inches of rain a year. 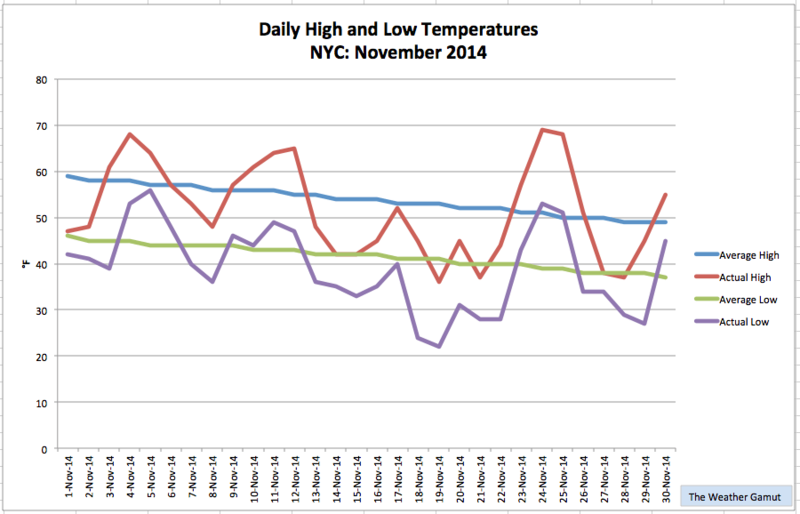 Spring and Fall are generally warm and dry. The latest round of UN climate change talks is currently underway in Lima, Peru. Representatives from nearly 190 countries are meeting to discuss ways to reduce greenhouse gas emissions, the main driver of global warming. Earth’s atmosphere is made up of a variety of gases, mostly nitrogen and oxygen by volume. The greenhouse gases, including water vapor, carbon dioxide, and methane, represent a smaller percentage, but are also a natural part of the mix. Acting like the windowpanes of a traditional glass greenhouse, these gases allow the sun’s energy (shortwave radiation) to pass through the atmosphere during the day and heat the Earth’s surface. 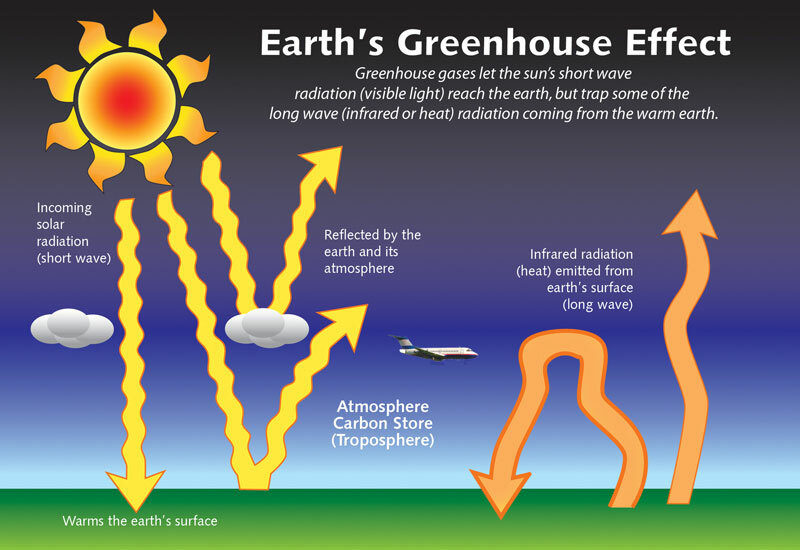 At night, the greenhouse gases trap some of the heat (long-wave radiation) that the surface emits as it cools. In essence, greenhouse gases function like a blanket that help keep the planet warm. Without them, the average surface temperature of the Earth would be 0°F – a temperature at which all the water on the planet would be frozen and life as we know it would not exist. Having too many greenhouse gases is also a problem – one that we are currently facing. Simply put, more greenhouse gases in the atmosphere trap more heat and increase the planet’s average temperature. During the last century, according to the IPCC, Earth’s mean temperature rose 1.5°F. As temperatures continue to rise, long established weather patterns and storm tracks are shifting. Different regions, in turn, are being affected in different ways. Some areas are getting wetter, while others are getting dryer, and coastal communities are feeling the impacts of rising sea levels. Scientists say that while some greenhouse gases come from natural sources like volcanic eruptions, the vast majority entering our atmosphere today come from human activities that burn fossil fuels. Before the industrial revolution in the late 1700’s, atmospheric carbon dioxide levels were 280 parts-per-million (ppm). This year, it passed 400ppm for the first time in human history. In addition, according to NOAA, 2014 is on track to be the planet’s warmest year on record. Any agreements reached in Lima on reducing greenhouse gas emissions will be used as the framework for a binding global treaty at the UN Climate Conference in Paris next year.